Are you serving Baked Ham this Sunday for dinner? If you are, Sassy Raisin Sauce is a yummy topping for the tender slices of Ham! 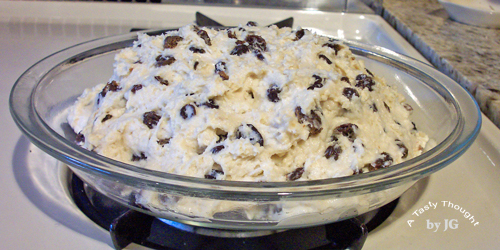 Filled with Raisins, it's an easy sauce to prepare at the last minute. 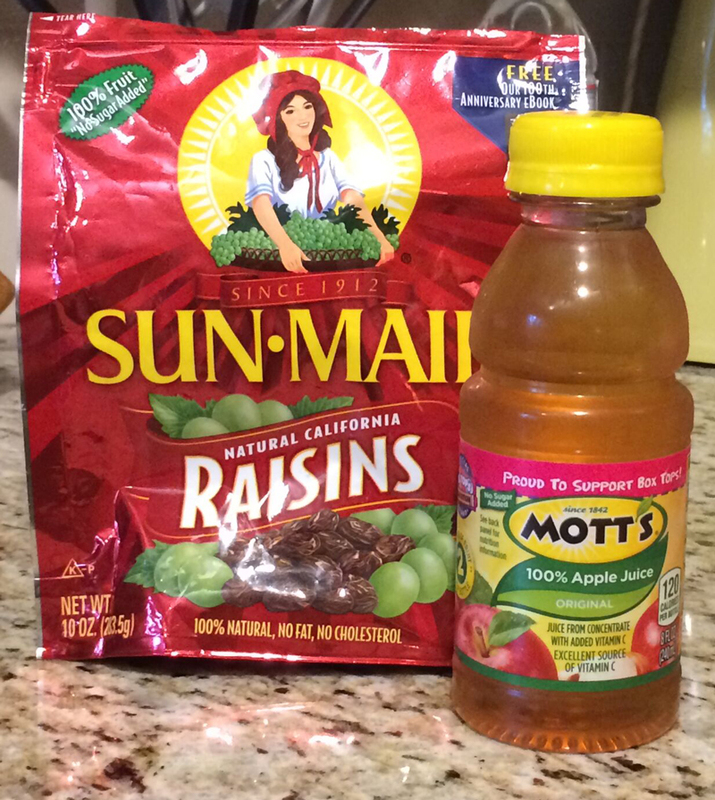 You probably already have the ingredients: Apple Juice, Raisins, Cornstarch & Butter/ Margarine. Think Sunday- you are almost ready to serve dinner. It's at this time that a tasty topping that comes together so quickly is needed! What a great added touch! And- it tastes so good. I also like to serve this topping over Butternut Squash Ravioli! Place Cornstarch in small saucepan. Slowly add in 1/2 Cup Apple Juice. Then, add remaining Apple Juice to saucepan, stir. Add 2 Tablespoons Butter/ Margarine. Stir constantly while cooking over medium heat. Sauce will thicken & boil. Boil & stir for 1 Minute. This is always a great addition to a Baked Ham Dinner! Or as a Butternut Squash Ravioli Topping! Those 3 ingredients need to be added to your grocery list if you do not already have them! The other ingredients are in your pantry. Why??? 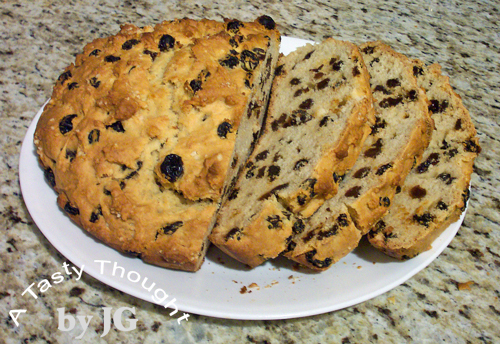 St. Patrick's Day is this Thursday & it's time to bake an Irish Soda Bread! That yummy bread that's also called Spotted Dog. Sure, you'll find them in bakeries & grocery stores, but why not bake your own? Once you bake it the first time it will be a tradition for you as it is for me. Before placing the sticky dough in the pie plate, rub a little Butter on the palms of your hands. The dough will then be easier to work with. Sticky Dough ready to be placed in my oven. After cutting the bread into slices, I place it in two sealed Ziploc Bags. This is a very tasty treat! Heat a half slice or a slice in the microwave for a few seconds. Yum! An added treat is to open the freezer door 3 weeks later & find 2 slices in a freezer bag. Yes, slices do freeze well. Will you be adding Raisins, unsalted Butter & fat free Buttermilk to your grocery list? If you do not have a chance to bake this in the next 2 days, it would be a great treat to bake this weekend! Baked Seafood Casserole! Oh, yum! For many years whenever this entree was on the menu at a seafood restaurant I thought well, maybe, mmm, but not today. I'd order the Broiled Seafood Platter. Well, that changed a couple of years ago. We were at the Rock Harbor Grill at the Cape (Cape Cod, MA). The restaurant was totally packed with couples & families on a September weekday evening. Everyone was chatting & enjoying their dinners. Once again one choice on the menu was Seafood Casserole. I took the plunge & decided to try it. Let me tell you- it was so yummy! 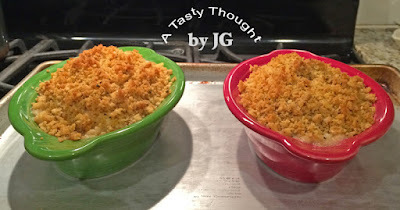 From that day on I bake Seafood Casseroles at home! No need to enjoy this delicious entree only at a restaurant. Why did it take me so long to taste it??? The first time I was thinking about baking this, I realized that the much needed individual baking dishes were not in my cabinet! It was time to get 4 pieces of colorful Fiestaware. It's been on my wish list. I needed individual casserole dishes, so the time had come to purchase some. 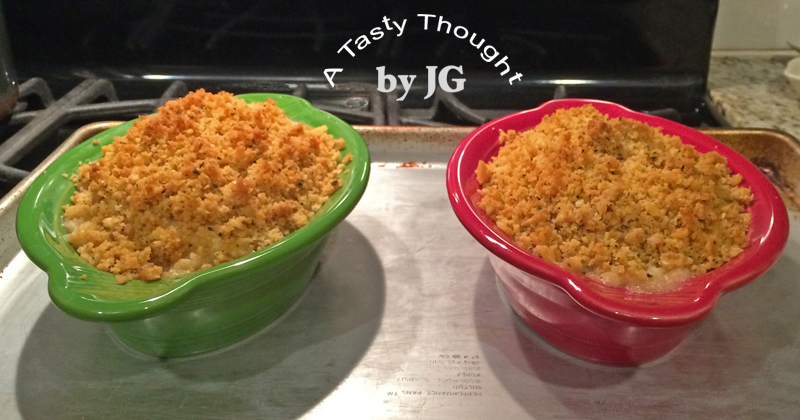 They sure work well when baking a Seafood Casserole! After looking at so many recipes for this yummy dish, I decided to include 3 types of seafood that are easily available to me. Uncooked Shrimp is always in my freezer & only needed to be defrosted (the microwave works here). Scallops & a piece of Haddock can be purchased quickly. 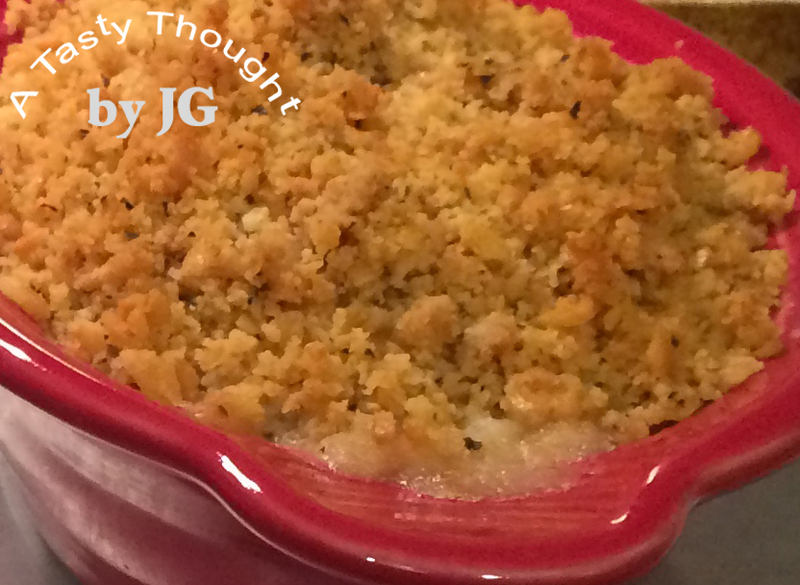 A Baked Seafood Casserole is so easy to make! The seafood is placed in the bottom of buttered individual serving/ baking dishes. Add a little shredded Cheese. Crush hint of salt Ritz Crackers & combine with Worcestershire Sauce, Garlic Powder & melted Butter to sprinkle on top. Bake in the oven for 45 minutes & the yummy Seafood Casserole is ready. How easy can this be? Absolutely delicious, too! Remove shells from Shrimp, devein. Cut Haddock Fillet in half. Rinse seafood under cool running water, drain. Place Scallops & Shrimp in baking dishes. Place Haddock on top, folding narrow ends under. In a small bowl combine crushed Ritz Crackers & Garlic Powder. Add Worcestershire Sauce & melted Butter/ Margarine, combine all. Spread half of Topping Mixture on seafood in each baking dish. We enjoyed this Seafood Casserole at dinner, again tonight. Working quickly, it took about 30 Minutes to prepare before baking. This is one great entree! Don't wait to order it at a restaurant! It's that good! Served with Rice & a veggie, yum! Have you baked a Seafood Casserole? For a very long time (years) I've been very conscious of eating more healthy foods. Using Olive Oil while cooking & drizzling Balsamic Vinaigrette containing Olive Oil over veggie salads has been my thing. Canisters of Oats are replaced often with newly filled canisters. 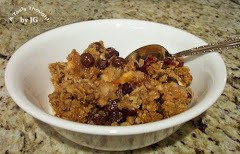 We like Oatmeal Cookies, Creamy Oatmeal at breakfast & also Apple Crisp with the oat topping. Peanuts & Pecans are great snacks, here. Fresh salads at dinner are enjoyed. Seafood grilled or baked is so good! Very rarely do I bake a dessert that contains more sugar than flour (or an equal amount) in the recipe. These past few months I've learned about the benefits of adding Avocados & fresh Pears into our diets. Both also help with lowering bad (LDL) cholesterol. Avocados are definitely not grown here in New England. But hey, if eating Avocados helps in lowering the bad (LDL) Cholesterol, I'm definitely in. They ripen quickly while sitting on the kitchen counter. Pears can be ripened in a couple of days by placing in a closed brown paper lunch bag & also placing on the counter. During the winter season the tomatoes purchased in the produce departments of grocery stores are not juicy & tasty as they are in the summer. In the summer we have locally grown tomatoes to enjoy! I've learned that Pears are a tasty substitute in a salad! 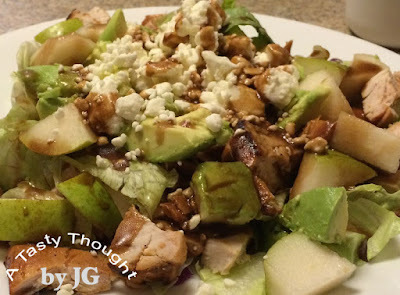 So, there are 2 new additions to any dinner salad or dinner salad platter that we enjoy- chunks of Avocados & chunks of Pears. This coming week promises to bring warm grilling weather, so chicken will be grilling one evening! Any extra grilled chicken will add to a dinner salad platter with chunks Avocados & Pears the following night! The dressing? Oh, Raspberry Balsamic Vinaigrette, of course! ***After adding Raspberry Jam or Jelly, shake container until Jam or Jelly is dissolved. After dinner this Raspberry Balsamic Vinaigrette is stored in my fridge. About 1/2 hour before using again, I place the salad dressing container on my counter. It will come to room temperature. All it needs will be a few shakes & it will blend together to be enjoyed again. (Theodor Seuss Geisel's step- daughter). 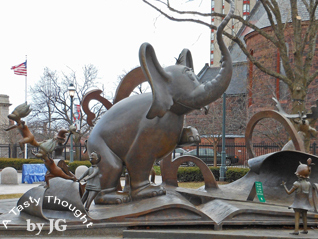 The creator of these childhood favorites, Theodor Seuss Geisel, was born in Springfield, MA on March 2, 1904. Seuss was his mother's maiden name. 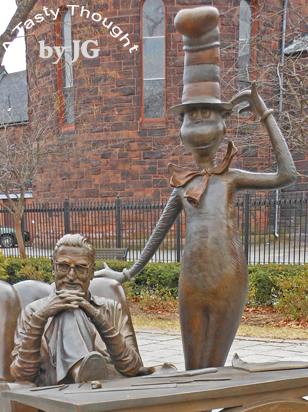 This author wrote so many wonderful stories for children (of all ages) using the name Dr. Seuss! The inspiration for his stories came from the city where he grew up- Springfield! Theodor grew up in the Forest Park area of the city. His dad was the Superintendent of Parks in Springfield. A zoo was located inside the beautiful city park known to all as Forest Park. Today many people who live outside the Springfield, MA area also recognize the name, Forest Park. The Festival of Lights are enjoyed here every winter. Growing up Theodor often heard the phrase, "If I ran the zoo..." That phrase was the inspiration for the book, If I Ran the Zoo. He did not live on Mulberry Street in Springfield, but the street is located not far from the Springfield Museums. The Smith Museum opened in 1896 and is a fave of mine. There are so many more stories about this storyteller from my area. My fave Dr. Seuss story is Green Eggs and Ham!